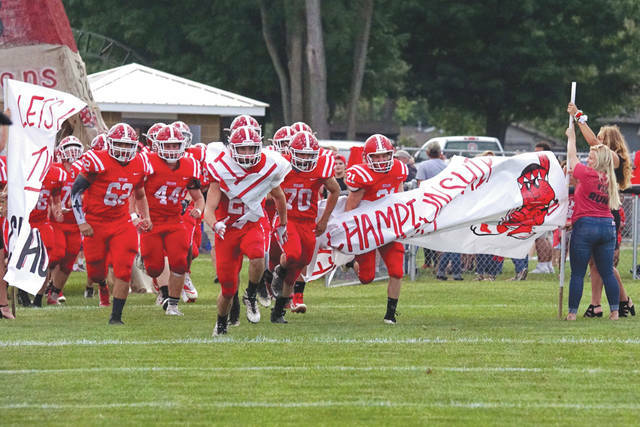 Cedarville High School football players charge through a pre-game banner on homecoming, Sept. 21 in Cedarville. 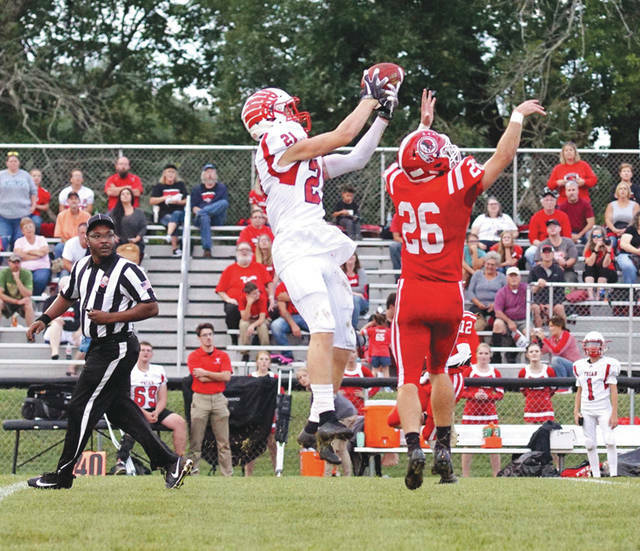 Triad senior tight end Isaiah Bruce (21) brings in a pass that had been tipped by Cedarville senior defender Brandon Pollock (26), in the first half of Friday’s Sept. 21 game at Cedarville High School. CEDARVILLE — A late player ejection sent momentum Triad’s way in a 35-34 come-from-behind win over host Cedarville, Sept. 21,to spoil Cedarville’s homecoming. It was a tightly contested game with each team answering the other’s score back and forth. The final quarter was filled with flag after flag as each team was regularly called for fouls, including multiple sideline fouls for each team. “The coach needs to keep his head level first and the team will go off of that,” Cedarville coach Jason Christian said. Cedarville seemed to be in control, up by 11 and driving down field as Triad gave up three different facemask penalties. However, the Indians couldn’t score. On defense their leading rusher coming into the game Kane Odon got ejected with a personal foul. This caused things to start to snowball against the Indians as they gave up the final 12 points of the game. Cedarville had a tough test to its defense. Triad running back Dylan Rice entered the game leading the Ohio Heritage Conference in rushing yards while Triad QB Logan McCoy was third in the conference in pass yards. Triad also played QB Jordan Simonelli for the first time this season after coming back from shoulder injury. The Indians defense forced four interceptions. However, they ultimately collapsed in the second half. Brandon Pollock led Cedarville with 166 rushing yards and two touchdowns. He also returned the opening kickoff for a score. Ultimately the team fell one point shy in the game and will look to rebound next week without Odon. According to OHSAA rules, Odon will also be ineligible for Friday’s Sept. 28 game against Southeastern.